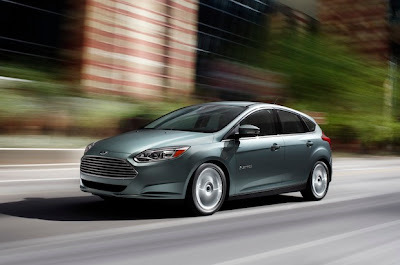 Ford Motor Company is again making NASCAR history this month as the Focus Electric becomes the first all-electric pace car to ever lead the field for a NASCAR Sprint Cup Series race at the Richmond 400. The all-new Focus Electric will perform all pace care duties at Richmond International Raceway on April 28. Approximately 35 percent of new car intenders are motorsports fans and 78 percent of them support NASCAR, according to Ford research. Additionally, Ford race fans are 67 percent more likely to consider Ford products than general market consumers. This marks the latest in a line of groundbreaking moments for Ford in NASCAR. In addition to being the first manufacturer to compete with a four-door sedan as its flagship model in 1998, Ford was also first to use a hybrid to start a NASCAR event when the Fusion Hybrid served as pace car for the Ford 400 at Homestead-Miami Speedway in 2008. The Focus Electric pace car will be unveiled for the public at the Virginia State Capitol in Richmond on April 25. Lt. Gov. Bill Bolling will deliver the Focus Electric to Richmond International Raceway, where it will serve as pace car for that weekend’s NASCAR Sprint Cup Series event.